The 2012 Nissan LEAF, the zero-emission car, continues in its second year of production to lead the drive into the “no gas, no tailpipe” zero-emission era. Designed specifically for a lithium-ion battery-powered chassis, the Nissan LEAF is a medium-size hatchback that comfortably seats five adults and has a range of 100 miles (U.S. LA4 cycle) on one full charge to satisfy real-world consumer requirements. 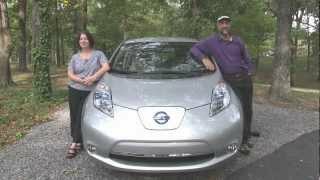 The 2012 Nissan LEAF™, the world’s first affordable, zero-emission car, continues in its second year of production to lead the drive into the “no gas, no tailpipe” zero-emission era. Designed specifically for a lithium-ion battery-powered chassis, the Nissan LEAF is a medium-size hatchback that comfortably seats five adults and has a range of 100 miles (U.S. LA4 cycle) on one full charge to satisfy real-world consumer requirements. Enhancements for the 2012 model year include the addition of a standard battery heater, heated steering wheel, heated front and rear seats, heated outside mirrors and rear HVAC duct on all models. Also, a Quick Charge Port is now standard on the LEAF SL. 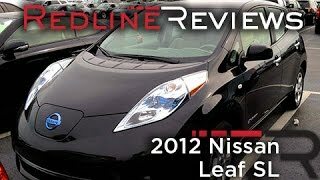 The Environmental Protection Agency (EPA) has rated the Nissan LEAF as "best" in the mid-size vehicle class for fuel efficiency and "best" for the environment with a 99 miles-per-gallon (MPG) equivalency rating (combined city/highway), along with a rating of 106 MPG city and 92 MPG highway. The MPG equivalency rating was developed by the EPA as a way to provide a standard so consumers can compare vehicles across the spectrum and make an educated purchase. The calculation is based on the EPA's formula of 33.7kW-hrs being equivalent to one gallon gasoline energy based on five cycle tests using varying driving conditions and climate controls. The vehicle was also rated best-in-class for the environment based on emitting zero greenhouse gases or other traditional tailpipe emissions. In addition, Nissan LEAF's 100-percent electric, zero-emission drive system is included on Ward’s Auto World magazine’s prestigious “10 Best Engines” list for 2011. It is the first time in the 17-year history of the magazine's “10 Best Engines'” that the selection committee has chosen a power system which doesn't have an engine and will never burn a drop of gasoline. Nissan LEAF was also chosen as one of the 2011's “10 most transformative products” by a panel of experts in addition to members of the Popular Mechanics magazine's editorial board of advisers. The front-wheel drive Nissan LEAF utilizes a dedicated EV platform with batteries housed in the floor for optimum vehicle packaging and weight distribution. The highly rigid body design includes a rigid-mounted battery frame, which helps provide greater body rigidity compared to a conventional compact car. LEAF rides on a 106.3-inch wheelbase, with a 175.0-inch overall length, 69.7-inch width and 61.0-inch height. Dimensionally, the Nissan LEAF falls in between the Nissan Altima and Nissan Versa, and like those vehicles provides room for five adults and a good-sized cargo area. Placing the batteries in the floor of the vehicle provides optimum weight distribution to help enhance handling and allows for five-passenger seating by not intruding into the cabin space. Nissan LEAF’s 24 kWh lithium-ion (Li-ion) battery is comprised of 48 compact modules of four cells each, which allows a high degree of packaging flexibility. The batteries are designed to maximize drive time and minimize charging time. The battery was developed by the Automotive Energy Supply Corporation (AESC), a joint venture of Nissan and NEC. Unlike conventional cylindrical batteries, the thin, compact laminated cells offer more flexibility in design applications. The battery powers a high-response 80kW AC synchronous motor, rated at 107 horsepower and 207 lb-ft of torque, which drives the front wheels through a single speed reducer. Unlike a conventional internal combustion engine, Nissan LEAF delivers 100% of its torque from start, delivering smooth, consistent acceleration and the driving feel similar to a conventional V6 engine. 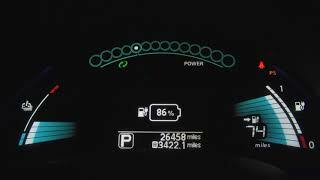 The Nissan LEAF offers a number of charging options. A charge port is located in the front body for the 200V charger and portable trickle charge cable (110V). The available Quick Charge Port (standard on SL) allows charging to 80% capacity in 30 minutes at public charging stations. There’s also a standard photovoltaic solar panel spoiler on SL models, which supports charging of the 12-volt battery for car accessories. Nissan LEAF’s standard regenerative braking system helps increase range. By applying the brakes or reducing speed by letting off the accelerator, the electric motor acts as an electric generator, converting energy that would otherwise be wasted into battery energy. To increase regenerative braking, there’s a driver-controlled Eco mode setting, which can also be used to reduce air conditioning and thus improve driving range when driving in urban areas. Nissan LEAF’s dedicated EV body is designed to offer “smart fluidity” – a fusion of sophisticated aerodynamic management and aerodynamic acoustics with the freedom provided by the new EV layout. The smooth, elegant movement of the body starts from the low, compact hood, moves through the iconic shoulder character line and on toward the large rear spoiler. The distinctive exterior styling is characterized by sharp, upright V-shaped design featuring long, up-slanting LED headlights with a blue internal reflective appearance. The headlights split and redirect airflow away from the door mirrors, reducing wind noise and drag. The headlights also consume about 50 percent of the electricity of conventional halogen headlights. Heated outside mirrors have been added for 2012. In the rear, the slim-type aerodynamic LED taillight design and crisp corners combine with the aerodynamic muffler-less rear bumper with rear diffuser to manage the aerodynamics of the rear end without compromising rear interior roominess. The coefficient of drag is just 0.29. The exterior also utilizes a flat underbody (including a large front flat floor cover, motor area undercover, front undercover and rear diffuser with fins) to help manage airflow under the vehicle. An innovative vortex-shedding roof-mounted antenna is one of many design elements utilized to help reduce wind noise. Other noise reduction features include a quiet-operation windshield wiper motor, a sound insulation windshield design and a dual-isolated motor-mounting system. “Because the operation of the Nissan LEAF powertrain itself is so quiet, the engineers paid extra attention to management of wind noise in the exterior design, since it would be more noticeable than with a traditional internal combustion vehicle,” explained Castignetti. Nissan LEAF’s charging point is hidden under a small door located in the front of the vehicle. The 5-door hatchback design also features chrome door handles, aerodynamic outside mirrors and a large greenhouse to provide a bright interior environment. Attractive 5-spoke 16-inch aluminum-alloy wheels mounted with P205/55R16 Bridgestone Ecopia tires are standard. Five exterior colors are available for 2012: Glacier Pearl, Blue Ocean, Brilliant Silver, Super Black and Cayenne Red. The roomy Nissan LEAF interior offers a pleasingly modern design created to provide a unique “EV touch” with “simple and human flow.” The bright, welcoming atmosphere starts with the wide, high tech instrument panel design – which is dominated by a twin combination meter display in front of the driver and a center “floating” piano black C-stack with a 7-inch information display. The digital “eyebrow” display at the top of the instrument panel provides high visibility for the Eco indicator and speedometer, while the lower liquid crystal meter display houses the power meter, battery temperature gauge, multi-function display, remaining energy gauge, capacity level gauge and distance to empty display. The flat panel center C-stack cluster continues the “EV touch” feel with the color monitor for the standard navigation system, available RearView Monitor and control of the audio and climate systems. The display also provides access to the CARWINGS telematics system, which is connected to a global data center, (subscription required, no charge for 36 months). Through CARWINGS, Nissan LEAF drivers are able to use mobile smart phones to turn on air conditioning and set charging functions remotely, even when the vehicle is powered down. The system also displays “reachable area,” as well as showing a selection of nearby charging stations. An on-board charging timer can also be programmed to start the charging event whenever desired. The Nissan LEAF interior also includes comfortable heated front bucket seats and a 60/40 split folding heated rear seat and rear HVAC duct. The seat fabric is made with partially recycled materials. Recycled materials are also used for the back door trim, roof trim and headliner, carpeting and a number of other interior pieces such as the door panels and center console storage cover. The center console area includes the palm shifter (inspired by a PC mouse) for the “by wire” drive selector. The 3-spoke heated steering wheel houses controls for the cruise control, audio system and standard Bluetooth® Hands-free Phone System. XM® Satellite Radio (XM® subscription required, sold separately) is also standard, with HomeLink® Universal Transceiver standard on Nissan LEAF SL models. One interior color is offered, Light Gray. The 100-percent electric Nissan LEAF has earned a 5-star overall vehicle rating for safety as part of the National Highway Traffic Safety Administration's New Car Assessment Program (NCAP). Nissan LEAF is the first fully electric vehicle to earn this highest distinction from the program. Starting with 2011 models, NHTSA introduced tougher tests and requirements in order to earn 5-star ratings. 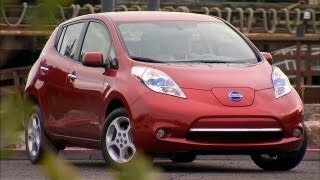 The Nissan LEAF has also been named a “Top Safety Pick” by the Insurance Institute for Highway Safety (IIHS), the first 100-percent electric vehicle to do so. The rating is given to vehicles that achieve the Institute's highest rating of "Good" in front, rear and side impact protection as well as being equipped with electronic stability control and earn a good rating in roof strength. Standard Nissan LEAF safety systems include Nissan Advanced Air Bag System (AABS) with dual-stage supplemental front air bags with seat belt sensors and occupant classification sensor, front seat-mounted side impact supplemental air bags, roof-mounted curtain side impact supplemental air bags for front and rear-seat outboard occupant head protection, 3-point ALR/ELR seat belts (driver’s seat ELR only) with pretensioners and load limiters, child seat upper tether anchor, LATCH (Lower Anchors and Tethers for CHildren) system and child safety rear door locks. Vehicle Dynamic Control (VDC) and Traction Control System (TCS) are also standard on all LEAF models. 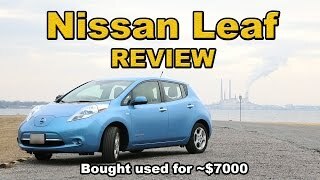 The 2012 Nissan LEAF is offered in two well-equipped models, the LEAF SV and LEAF SL. Standard features include a 6-way manual driver’s seat, 4-way manual front passenger’s seat, front door map pockets, passenger seat map pockets, trip computer (instant and average energy consumption, driving time, outside temperature and autonomy range), Automatic Temperature Control (ATC), center console storage and electric parking brake. Other standard equipment includes an AM/FM/CD with MP3/WMA CD-ROM playback capability and 6 speakers, auxiliary input jack ad USB Connection Port for iPod® and other compatible devices, Nissan Intelligent Key® with Push Button Start, power windows with driver’s window one-touch auto up/down, power door locks with auto locking feature, remote charge door release, two cupholders, two bottle holders, variable intermittent windshield wipers, 12-volt power outlet and remote keyless entry system with remote windows down and hatch release. The Nissan LEAF SL model includes a photovoltaic solar panel spoiler, fog lights, auto on/off headlights, cargo cover, HomeLink® Universal Transceiver, RearView Monitor and Quick Charge Port. A Roadside Assistance program is offered for 36 months at no charge, as is service for the CARWINGS telematics system. The advanced lithium-ion battery pack carries an industry-competitive warranty of 8 years or 100,000 miles. Initial Nissan LEAF production is sourced from Oppama, Japan, with battery production at Zama, Japan. Construction is underway for new electric vehicle assembly and battery production facilities in Smyrna, Tennessee, with production slated to begin in 2012. The plants will have an eventual annual production capacity of 150,000 electric vehicles.